SofLens daily disposable contact lenses combine all-day comfort with crisp, clear vision, especially at night. SofLens delivers all the fresh, new lens benefits of a daily disposable lens and much more – giving you a comfortable lens-wearing experience. Fresh, new lenses everyday. No daily cleaning, storage, or care required; wear them for a day, then throw them away. Comfort. Vision. Convenience. SofLens daily disposable lenses achieve a high level of comfort through ComfortMoistTechnology – our unique lens design and innovative packaging solution. The lens design is exceptionally thin, allowing for a remarkably natural feel on the eye. The slow-release packaging solution creates a cushion of moisture around the lenses – keeping your eyes comfortable all day through the end of the day. 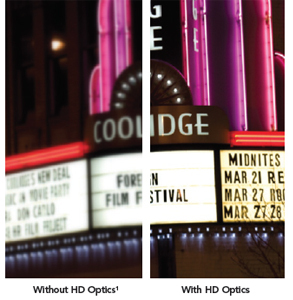 SofLens is the first daily disposable lens with High Definition Optics – a technology that helps reduce the appearance of blurriness, halos, and glare across a full range of conditions. The result is crisp, clear vision no matter the time or place, and especially in low-light situations. 1. Simulated retinal image. Not intended to depict visual acuity.